The warm, traditional appeal of this sofa sleeper is prominently displayed with its rolled arms, nail head trim, and turned feet. The two 20x20 inch accent pillows offer comfort and visual interest. Sit back against the plush cushions and enjoy a comfortable experience while you watch your favorite shows and movies and visit with family and friends. Easily pull out the Air Dream sleeper mattress with adjustable firmness to accommodate overnight guests. Enhance your living room's decor with the traditional appearance of this sleeper sofa. The Laramie Air Dream Sofa Sleeper with Nail Head Trim by Broyhill Furniture at AHFA in the area. Product availability may vary. Contact us for the most current availability on this product. 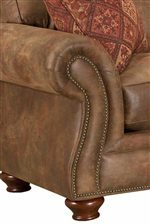 Arm Comfortable flared rolled arms add a traditional appeal to your decor, accented with classic nail head trim. Leg or Skirt Turned exposed wood legs add a traditional ambiance, and are available in your choice of finishes. Frame Construction In selecting materials, designers and engineers design products that use a combination of selected hardwood and softwood solids, selected hardwood and softwood veneers, and wood and/or simulated wood products. Wood frames are constructed from wood obtained from Sustainable Forestry Initiative (SFI) sources. Interlocking wood frame for maximum strength and durability. 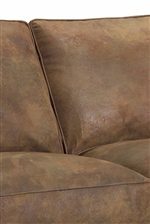 Padding & Ergonomics For comfortable, eco-friendly seat cushions that last, Broyhill uses DuraCoil™ technology. Like a pillowtop mattress, it's a system of individually wrapped coils sandwiched between two thick layers of soy-based foam. DuraCoil™ cushions outperform most foam cushions in standardized industry tests. Back cushions with multiple compartments to keep fiber in place. Sleeper Mechanism The sleeper mechanism includes a pop-up headrest for reading or watching television. Pull-Out Mattress The Good Night Sleepers feature top quality innerspring mattresses. The Laramie collection is a great option if you are looking for Traditional furniture in the area.